Killer Characters: Scottish Summer Giveaway! Greetings, on a beautiful summer day, from Inversgail, my adopted hometown on the west coast of the Scottish Highlands. That sounds like pure bliss, doesn’t it? It is. Inversgail is a gem with a natural harbor, white sand beaches, and water warmed by the Gulf Stream. Hills rise behind the charming houses and shops creating a picturesque backdrop perfect for photographers and hillwalkers. Even the rain is charming in Inversgail, which is good because it rains fairly often. I heard something recently that might explain all the rain—if you see a cat washing its ears, then rain is on the way. If that’s true, then the cats of Inversgail must have the cleanest ears in creation. Do you know how many Scots words there are for describing rain? Here are a few: Black weet, blatter, blaw bye, and dreep. Dribble, drouk, onding, and peuch. Plype, saft, scudder, and smirr. There are more, too, and I’ve heard some of them, but not all. I’m going to start keeping track, though. It’ll be a life list like birders keep. You could almost put them to music and dance a jig. Someone asked me, the other day, if I could go anywhere at all on holiday, where would it be? Quite honestly, even though we’ve been here a few months now, the “on holiday” feeling hasn’t worn off. I’m sure it will, though, and maybe sooner than I’d like if what I’ve heard about Daphne Wood is true. She’s the author coming to Inversgail for a three-month author-in-residence program. Her reputation for being eccentric has a few people worried. Hmmm. But Daphne doesn’t arrive until the end of August, and we have the whole summer ahead of us, so let’s celebrate with a giveaway! 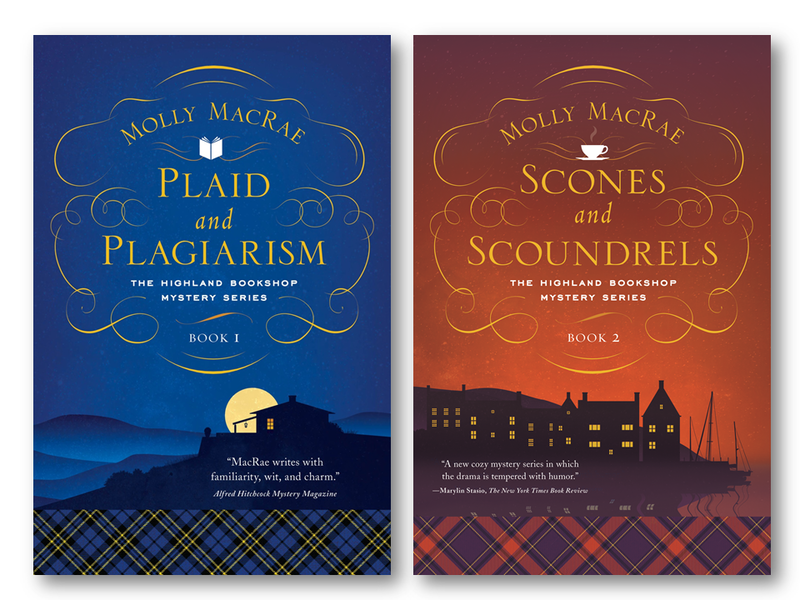 For a chance to win a signed copy of Plaid and Plagiarism, Highland Bookshop Mystery #1, leave a comment below, telling me where you’d like to go on holiday. Be sure to include your email address. I’ll choose one comment, at random, to win, at 10:00 a.m. on 6/25. 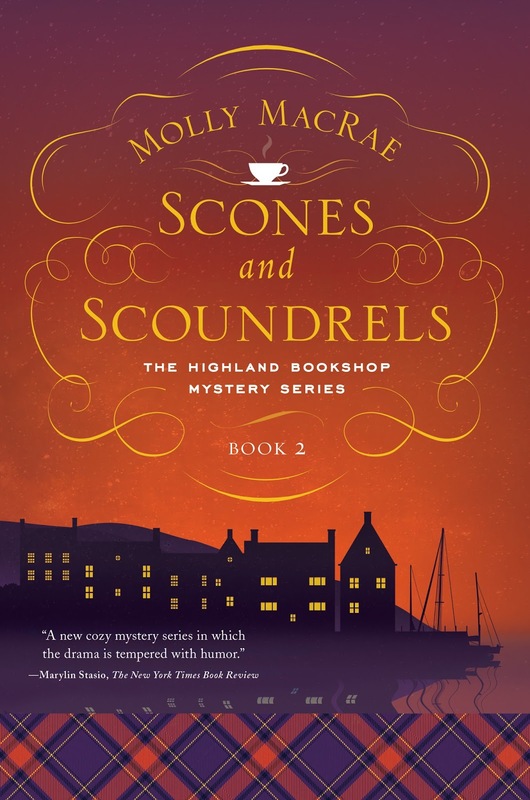 Watch for Scones and Scoundrels, Highland Bookshop Mystery #2, coming in January 2018 (available for pre-order now). A body outside a pub, a visiting author determined to find the killer, and a murderously good batch of scones . 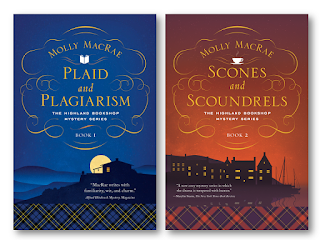 . .
Molly MacRae is the author of the award-winning, national bestselling Haunted Yarn Shop Mysteries and the Highland Bookshop Mysteries. Visit Molly on Facebook and Pinterest, connect with her on Twitter @mysteryMacRae, or find her the first Monday of each month at Amy Alessio’s Vintage Cookbooks and Crafts. Make plans! You won't be disappointed. Using London as my base I'd like to travel throughout Great Britain for 6 months or so. I wish!! Wouldn't that be a fantastic trip? I hope you get your wish someday! Love your list of rain words! I think the Irish gave up trying a long time ago. The best Irish expression I know is "it's a soft day," which translates to "it's raining (but not too hard)." I may need to borrow "dreep." Soft is such a good description. I've always liked dreich, too, and raining stair rods. Thanks for stopping by! Have always wanted to visit Scotland. Your book sounds great. Thank you! And you should definitely make plans for Scotland. You'll never forget your time there. Scotland sounds wonderful. I'd love to visit. Italy is wonderful. I'd love to spend a few seasons in Tuscany. Thanks for stopping by. Scotland is lovely. Make plans! I've never been to Sicily, but would love to go. I've been to Florence, Venice, Turin, Milan, and now I'll have to go to Sicily! England and Scotland as I never got the chance to make the trip with my Mom before she passed. Do it for her, then, Karen. You won't regret it. Thanks for stopping by, today. While I'd love to travel the world and revisit Israel where I have family. I've always wanted to visit the British Isles. I have friends over there that I only "speak" to online and once in a blue moon by phone. This year though we're going back up to Cape Cod to relax and enjoy the sites we misses on our last three vacations there. We're also staying at a hotel that is centrally located and I made friends with the manager. I'd love to visit the castles and cottages of Scotland and England. Stonehenge too. Possibly see the sights and walk in the same place of some of my ancestors. Then you should! Stonehenge is really cool. The castles, too, of course. I hope you get to take your trip! I've heard Alaska is gorgeous because when God was finished making the world, he took all the bits of leftover beauty and tossed them there. I love that idea, and I'd love to see it. I hope you get to go to Alaska AND England! One of my bucket list places to visit, too! I met Hamish Henderson, considered to be the father of Scotland's post-war Folk Revival, years ago in Edinburgh. Are you related? He was so cool! to go with me. I would love to go to Scotland. Scotland will be wonderful too. thanks for the offer of the books. Australia and New Zealand - I'd love to visit both places. I hope you get to Scotland someday! I would love to do Australia and New Zealand! I would, too! Thanks for stopping by, today. Nothing wrong with dreaming! Thanks for stopping by today. I'd like to see that. I'd like to hike down to the bottom. Thanks for stopping by! San Francisco is wonderful all by itself, but with kids and grandkids there, it would be a perfect vacation. I hope you get to go before too much longer. I don't know where I would want to go. There are so many amazing and interesting places out there. Thank you so much for the chance to win! I know what you mean. Every time I hear someone describe a trip to a place I haven't been, I immediately want to go. If you get the chance, you should go. It's breathtaking. Definitely on my list of places to go. I wonder if we'll ever make it? I've enjoyed visits to France and Italy. Brittany is lovely. So is the south of France. And Florence and Venice! I hope you get to see them! If I was able to travel I would love to visit my cousin Carol in Aukland New Zealand. We spent much of our youth together he as adults we were separated by distance only. Thank goodness for the internet and prior to that letters and phone calls, but I would love to see where she had lived for 50 years. Oh, I wish you could get there, too! It sounds like you'd have such a great reunion. Thanks for stopping by, today. Ponies! They're adorable. I hope you get to take your trip someday. I would love to visit the British Isles. Love to visit Ireland and Scotland. duduerst(at)tds(dot)net. Beautiful, beautiful places. Thanks for stopping by today. "a murderously good batch of scones"
That gives a new meaning to wicked good! I'd love to go to a nice warm place in the winter on holiday---maybe Hawaii or Bahama Island. I hear you, Sue. Warm in the the winter, cool in the summer. Aaaahhh. I would like to to visit the United Kingdom, Scotland and Ireland. I would love to visit all of the historical sites. That would be a wonderful trip, Dianne. Start planning! Isn't that a fun idea? And it works in Scotland, because cats are always washing their ears and it rains so often. New Orleans sounds interesting to me. Doesn't it? I'd like a food tour of New Orleans. I've always loved that name. I hope you get there and have a great time! I would like to go on holiday to Hawaii - volcanoes, waterfalls, beautiful beaches, and even whale watching would be delightful! That sounds like a wonderful trip! I hope you get the chance to go. I've flown over Ireland and love the way it looks like a quilt. Someday I'll get over there. I hope you do, too. If I had a chance to go on holiday, I would love to take a trip on the Royal Scotsman. Thanks for the great reads. Australia, Scotland, and many of the national parks in the USA. That's wonderful dream you have. Dreams to come true, and after five years with no vacation, it sounds like you're due. Good luck! Oh gosh if I could choose it would definitely be the U.K. and Scotland would be on the top of the list along with Devon, England. My Ancestors are Scots.. we were at Culloden and that's how Dad's family ended up here. Not stealing sheep as he used to joke! Thanks for the chance. Devon for Devon cream! It sounds like you have a wonderful itinerary already planned. I hope your wish comes true and you get to make the trip. Chiming in from the Blue Plum (the Haunted Yarn Shop Mysteries) - may I go with you, Mary? I would love to make a whole trip out of the Edinburgh Wool Festival, the Loch Ness Knit Fest, and the Shetland Wool Festival. Bliss! Scotland, Ireland, and England would all be great but I am also hoping to see the Grand Canyon one day. Thanks for a chance to do some armchair traveling. Any and all of those places would make great vacation trips. Happy travels, one way or the other. I would love to see Scotland, Ireland and England. Thanks for this giveaway! Holiday Destination? I would love to travel to Great Britain...the Cotswolds, Scottish Highlands, ancient stone circles and walls, tea shops, pubs, and castles. This is #1-20 on my Bucket List! Great bucket list! I hope you get to mark all of them off. If I was brave enough to fly I would love to visit Scotland and Ireland. Where my ancestors came from. Ah, fear of flying. Can you get someone braver to go with you? It would be so worth it! Thanks for stopping by. I want to visit Scotland, Ireland, and the U.K. Thanks for the chance to win a copy of your book.